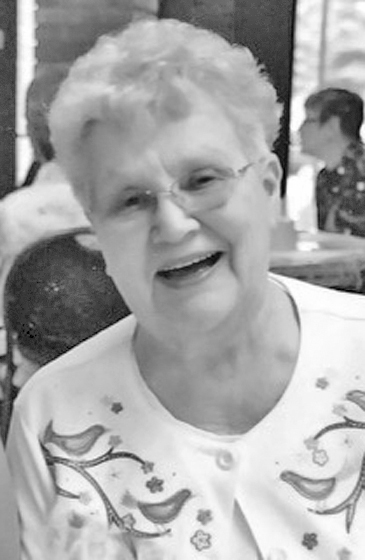 SUOMI LOCATION – Mary Beverly Brintlinger, 88, a proud longtime Suomi Location resident, passed away early Sunday morning, February 3, 2019 at the Eastwood Nursing Center in the care of her loving family. Mary was born July 19, 1930 to Emil and Vieno (Pottala) Larson in the sauna at their Palmer home, and graduated from Negaunee High School, Class of 1947. Following graduation, she was employed by Michigan Bell Telephone in Detroit where she met her husband, Richard Brintlinger. They were married February 19, 1949 in her parents home in Suomi Location. Mary was a devout member of Community Lutheran Church, Suomi Location where she taught Sunday School, Bible history, played the organ and loved pasty making. In her free time, she enjoyed reading, knitting, watching Jeopardy and gameshows, and cheering for the Negaunee Miners, Green Bay Packers, Detroit Tigers and Red Wings. Her most favorite part of life was being a loving and devoted wife, mother and grandmother. Surviving are her two daughters, Mary (Gary) Connors of Gwinn and Heidi (Kim) Lenten of Suomi Location; two sons, Taylor Brintlinger of Negaunee Township and Kurt (Trish) Brintlinger of St. Cloud, MN; daughter-in-law, Terri Brintlinger; former daughter-in-law, Kathy Brintlinger; grandchildren: Scott (Connie), Becky, Heidi (Rick), Adam, Zachary, Jacob (Ashley), Hannah (Luke), Eli, Ben (Katie), Matt (Lauren), Max (Traci), Abram, Siiri (Griffin), Louis (Sidney), Monika (Mike), and Kyle (Mandy); step-grandchildren: Alison (David) and Denise (John); great-grandchildren: Erin, Erika, Elvi Jean, Liina, Micah, Finn, Maggie, Jay, Cora, Jaxen, Quinten, Luke, Seija, Ally Marie, Ty, Roland, Ellis, Oscar, Alyssa, Janel, Connor, Raymond, Eva, Gaven, Olivia, Brendan and Colby; nieces and nephews: Janet, Cindy, Cathy, Sally, Jim and Greg; special cousins: Marge, Elaine and Virginia; and her very special friend, Jean Laituri. She was preceded in death by her parents; her husband Richard in 1987; son, Todd Brintlinger in 2003; son-in-law, Steven Sather; brother, Vernon (Barbara) Larson; two infant brothers, Lewis and Irving; and a sister, Janet Larson. Memorial services will be held at 1:00 pm on Friday, February 8th at Community Lutheran Church in Suomi with Rev. Douglas Norquist officiating. The family will greet relatives and friends from 11:00 am until the time of services at 1:00 pm at the church on Friday, and also at a luncheon in the church hall following services. Interment will take place in Bakkala Cemetery. In lieu of flowers, memorial contributions may be directed in Mary’s memory to Eastwood Nursing Center Activity Fund, Community Lutheran Church, Suomi, or Bay Cliff Health Camp.